Concentrate on your business – with us small companies grow bigger As a tenant in this centre, you have a professional appearance externally and an efficient service set-up internally with a full-time reception and the many shared services: Sparring, consultancy and networking , reception services for customers and visitors, as well as post and parcel handling, modern meeting and conference facilities, great cafeteria with hot dishes, sandwiches and salad bar Kitchenettes and printing facilities. Fast broadband connection (Hotspot). Free parking for employees and guests Social events: DHL relay race, summer barbecue, Breakfast roulette, family Christmas party. Fitness, massage and hairdresser. A modern, trendy centre that offers its clients the chance to play hard as well as work hard. Fully furnished offices offer flexible contracts and the chance to take space quickly and efficiently. Contracts can be negotiated on to ensure that you get a fair price. Meeting rooms are available, high speed internet and there are showers on site. The centre is fully staffed and regularly cleaned. Social events are organised and there's table football and ping pong. Two stations are close by. Trains leave Ostbanetorvet Street Station regularly and Aarhus Central Station is within a twenty minute walk away, making business connections very easy. The airport is an hour away and the centre is close to many bars and restaurants. Set within a beautiful, modern building designed by the distinguished architect C.F Moller this centre is ideally placed in the city centre of Aarhus, approximately 0.5 miles to the pedestrian & shopping area of the inner city. Spreads over the entire first floor of the building; with 10 closed offices of different sizes - from two to six desks, along with two meeting rooms and a lounge area. The centre houses businesses such as consultants and sales organisations along with some IT companies giving a varied atmosphere throughout the floor. Aarhus has a number of international class research environments. This an office space at the centre of the three strong clusters along the knowledge axis from the Cleantech cluster on Navitas over the IT cluster at Katrinebjerg and the Health cluster in Skejby. When it comes to innovation and entrepreneurship, the centre has its finger on the pulse. Read the latest news (in Danish), find out about new trends, see current events and stay tuned via our Newsletter, Facebook and LinkedIn. Housing architects, designers, photographers, web designers, engineers and digital/ad agencies this fantastic workspace just outside the city centre provides a range of private and co-working space. The centre has one regular meeting room with room for 12 people, but in the middle of the big room you will find the classic retro caravan - perfect for a creative brainstorm which can be used for meetings and team conversations. The centre has a lounge area, workshop zone and a big kitchen with room for 10 colleagues at the table. There is also a retro caravan on-site used as an informal meeting and brainstorm space. 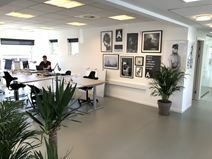 Right in the city centre of Aarhus, this business centre is placed in the top of an old warehouse from the 1870’s and houses businesses such as; consultants, IT companies and digital/ad agencies. Decorated in a casual Nordic style, the space is spread over five closed offices of different sizes - from two to six desks, and an open space area with six desks, as well as two meeting rooms for up to four or eight people.